National Championships - Minor changes to specific draws only the draws below have changed all others remain the same. Please email me if you have any problems. I have tried to strike a balance between getting matches played so you do not have too long hanging around and giving players breaks between matches. This has not always been possible especially with some draws where players have byes through or players competing in multiple grades. I will email again in the morning if there have been any changes and include full tournament rules and details. Entry List update 29th - Entries Close Tomorrow! ​Entry List update 24th - One week to go before entries close! If you know anyone who you was planning to enter but has not put there entry in yet please give them a nudge! Update in the next couple of days regarding plans for the evening on the Saturday. I will book a restaurant in the city centre, hopefully as many of you as possible will want to join! Click here to enter online now! ​The British National Racketball Championships will take place at Nottingham Squash Rackets Club on the 7th and 8th of April 2018. This will be a two-day event with most grades starting on Saturday morning/ lunchtime and finishing on Sunday afternoon. As in previous years the event will run as a knockout with a plate competition for 1st round losers. Last year’s National Racketball Championships was a huge success with players competing from all over the UK. In total more than 160 players tried their hand at taking a title. 16 categories ran and saw some new champions and players who added titles to their ever-growing tallies. Ryan Loska M35’s, Jason Russell M45’s, Charlotte Elgood W40’s, Nina Parker W45’s, Graham Greensall M65’s and Rob Astbury M70’s all claimed titles for the first time. Tim Vail secured his 9th National Racketball Championships with a convincing win over squash star Adam Murrills CWR 82. Natalie Lawrence has now made it 3 wins in 4 years in the women’s. Richard Davies became over 40’s champion and added this title to the over 35’s he won back in 2012. Neil Baldwin goes into 2018 with three titles in the Over 50’s and two in the over 40’s won back in 2011 and 2012. Lesley Sturgess added two titles in 2017 to her ever-growing tally. She now has 5 titles in the over 45’s, 4 in the over 50’s and two in the over 55’s. John Cordeaux claimed the Over 55’s for a second year running with victory over previous national champion Mike Phillips. Peter Scott and Rod Embley both retained there titles in the Men’s Over 60’s and Over 75’s respectively. Bet Dryhurst is still way out in front in terms of number of titles with 30 in total. Her first came in 1985 in the women’s main category. Over 40’s 1985, 1986, 1987, 1988, 1989, 1990, 1991, 1992, 1996, 1997, 1998 and 1999. Nottingham has a thriving Racketball scene and is the home of UK-Racketball, making it a natural choice to host the National Championships. Nottingham is the biggest squash venue in the country and the first venue to become a host for a UK-Racketball Event back in 2010. With 10 excellent squash courts, including six glass backs and one of the best championship show courts in the country, the club is an ideal host for any top Racketball tournament. The British National Racketball Championships is open to all ages and abilities. Whether you’re looking to take on a new challenge or chasing a top title, this is the tournament for you. The UK-Racketball Series was founded on the principle of being accessible and open to anyone, no matter what their standard or age. This is the ethos with which we ran tournaments in 2010 and will be the same focus in 2018. More and more women are taking up racketball each year and the 10 grades on offer at the National Championships this year reflects this. In the Women’s event last year, Natalie Lawrence retained her Women's Open Title and Bet Dryhurst claimed her 30th National Title spanning across all categories. Please help us to promote this event to anyone who you think might be interested by sharing this link on Facebook or directing players to the website. In the men's open category we are still looking for someone to try their hand against Tim Vail who still rules supreme. He secured his 9th National Title last year with a win over squash professional Adam Murrils 11/5, 11/4, 11/5 a walk in the park against one of the best athletes in the squash world with a current world ranking of 82! ​Nottingham Squash Club will be putting on special food and drink deals throughout both days. A happy hour will run during the final couple of rounds on the Saturday evening. Matches on the Saturday will finish by 19:30 and a table will be booked in the city for a meal and social. This will be a great chance to chill out after a hard day's Racketball and get refreshed and recharged ahead of the semis and finals on the Sunday. More details to follow. If you are unsure which category to enter please feel free to contact Mark Fuller directly on 07846067505 or email us at info@uk-racketball.com and we will be happy to advise you. If entries to a category are not sufficient grades may be merged, however all participants will always be informed in advance and they will have a choice if they would still like to play, this has never happened in the last three years. We will run a plate competition for all categories. You need to inform the tournament organiser before the event starts if you do not wise to play in the plate. This will need to be done before the draws are done so before Monday 27th March. T-shirts are optional at only £5.00 each, this is for a quick dry shirt designed specifically for the UK-Racketball Series. Have a look at the information pages for the UK-Racketball Series to see previous shirt designs. When the designs for the shirts have been done we will publish on the website. All shirt orders must be made before the event. All matches will be best of 5 games to 11 PAR (point a rally) scoring. Events will be straight knockout or group stages depending on entries. In the UK-Racketball Series all matches are refereed by the player who won the previous match on that court. The feedback on the Series events is that this works really well and therefore the same format will take place in The National Championships. WINNERS WILL REFEREE THE NEXT MATCH ON THE COURT THEY HAVE JUST PLAYED ON. If you are playing in multiple grades and have another match following on you will need to find someone who can referee for you. The best thing to do is to explain to your opponent the situation and see if he can help. If you are unable to referee for any reason and are unable to find someone to help you please contact the desk as soon as you can. This event will run well with you corporation. This is another major change but something that we hope will make the event run smoother. Friday 30th March – 8 days before the event - All events will close on midnight the Friday before the event so almost exactly a week before the event. Sunday 1st April – 6 days before the event - An entry list will be released on www.uk-racketball.com on the Monday before the event. If you have entered the event then please check on the Monday that your entry has been received and that you are on the list. If you should be on the list but are not then please email Mark Fuller mark@starsportsdevelopment.com as soon as possible. 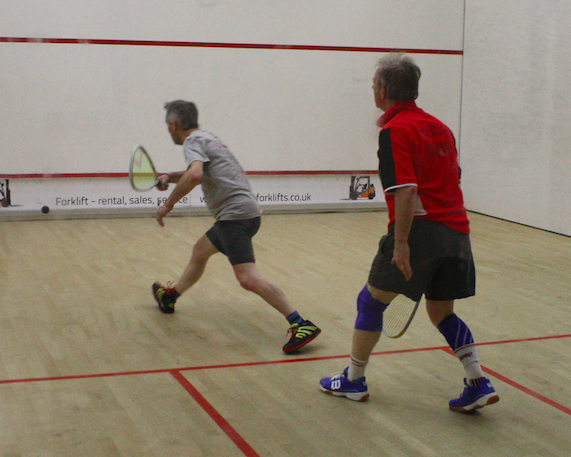 ​Nottingham Squash Rackets Club has plenty of onsite parking, a bar open all day serving hot and cold food, a gym to warm up in before your matches and a sauna and steam room to warm down and relax after playing. Along with the facilities and atmosphere the club location is another reason why events at Nottingham prove to be so popular. With the city being central to the UK and the club based only 15 minutes from the M1 Nottingham can be reached easily from all areas of the country. Lawrence Ogden will once again be recording videos of the event for his Racketball youtube site. You can find loads of Racketball videos by following this link - https://www.youtube.com/channel/UCOCDhogUhLhXdcGnD58Nlbw - Lawrence does these videos on a voluntary basis and has done for years with a great stock pile of matches now recorded! Reports will be uploaded directly to the UK-Racketball website. ​There is a good choice of accommodation in the local area, with Nottingham city centre on the club’s doorstep. A good budget option is the Premiere Inn Chapel Bar with rooms from £38. It’s a 15 minute walk from the Nottingham Squash Rackets Club and is located in the city centre meaning you’ll have a good choice of food and drink establishments. If you prefer something a little fancier, The Walton Hotel is a nine minute walk from the club and offers doubles from £160 a night. In the main event there was an early upset when ¾ seed and winner of UK-Racketball Series title Dan Soar was defeated by local Nottingham player Tom Bailey in the first round. Soar was the only seed to fall however with one seed Tim Vail, two seed Adam Murrills and the other ¾ seed Ollie Turner and making it through without dropping a game. The semi finals again went to seeding with Tim Vail quickly disposing of Joseph Blackmur and Adam Murrils eventually overcoming the dogged determination of Ollie Turner. The Series would not run without the support that it receives from its sponsors. Our long standing title sponsor HEAD are returning for another year this year. HEAD are one of the biggest sports brands in the world, produce some of the best racketball rackets, and are a fantastic supporter of racketball - so we are thrilled to have them on board again. Featuring HEAD's revolutionary Inner Grommet System Technology and patented twin tube construction, their rackets deliver superior performance, power and stability. Many of HEAD’s rackets feature Graphene XT Technology. Once played with a Graphene racquet, you never want to miss the extra swing it gives you with each shot. Now imagine the next stage of this revolutionary technology: GRAPHENE XT, a new generation of HEAD racquets with enhanced weight distribution, perfect maneuverability and a fast performance that will just blow your opponents away.